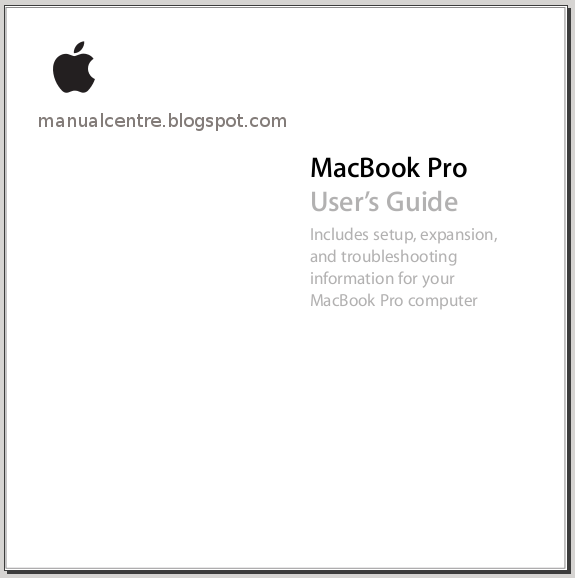 The Apple MacBook Pro Manual or user guide is available online. It comes with PDF format and support in english language. The main issue of this manual for example about setting up, troubleshooting, installing guide, basic operations and safety. There is two Apple MacBook Pro with display screen like 13.3-inch and 15.4-inch. The 13-inch MacBook Pro is powered by 2.5GHz dual-core processor (Turbo Boost up to 3.1GHz) with other options like 2.9GHz dual-core (Turbo Boost up to 3.6GHz). While for the 15-inch MacBook Pro is powered by 2.3GHz quad-core processor (Turbo Boost up to 3.3GHz). The Apple MacBook Pro user manual consist of 139 pages with file size of 2.3 MB. It's devided into 10 section. In this manual contains many reference information such as Setting Up Your MacBook Pro, Calibrating Your Battery, Learning About Mac OS X, Customizing Your Desktop and Setting Your Preferences, Using Applications, Software Up to Date, Connecting to a Printer, Connecting a Camera or Other FireWire or USB Device, Connecting with FireWire, How AirPort Provides Wireless Internet Access, Setting Up a Bluetooth Device, Securing Your MacBook Pro, Installing Additional Memory, troubleshooting, Installing Xcode Tools, Using Apple Hardware Test, and more. My Internet connection doesn’t seem to be working. How do I set it up? How do I set up my printer? Is it compatible with my MacBook Pro? How does the Mac OS X interface work? How do I make my MacBook Pro battery last longer? I put a disc in my optical drive, but nothing happened. How do I know if the disc is compatible with my optical drive? How do I connect an external display, TV, or projector with a DVI connection to my MacBook Pro? I hear a fan coming on and my MacBook Pro seems to get quite warm. Is that OK? My application or Mac OS X doesn’t seem to be working correctly. Do I need to reinstall Mac OS X? I installed an application on my MacBook Pro, but it doesn’t seem to be working. Where can I go for help?